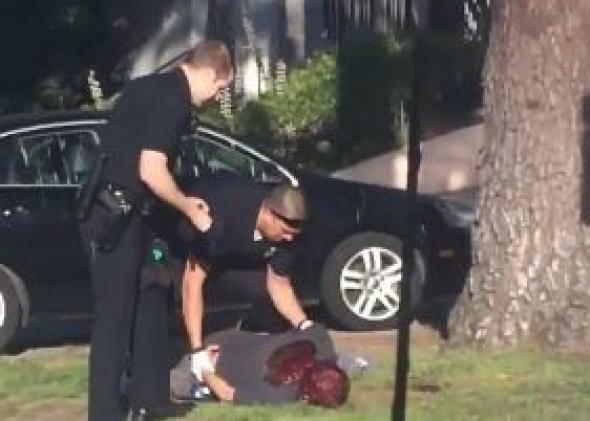 Screengrab from video showing LAPD officers handcuffing critically injured unarmed man. Los Angeles police shot a man after he raised an arm wrapped in a towel, which officers apparently feared was a weapon. “Police said officers thought the man had a gun but turned out to be unarmed,” reports the Los Angeles Times. The unidentified man apparently waved down a patrol car yesterday afternoon. “This person extended an arm wrapped in a towel. The officer exited the vehicle and said, ‘Drop the gun, drop the gun,’” LAPD Lt. John Jenal said. And that is when at least one officer opened fire. A witness who was passing by filmed the officers after the shooting showing how they apparently thought their first priority was to handcuff a man who has a clearly serious head injury.